The Fastbind Pureva XT offers digital finishing a compact and versatile all-in-one solution for high quality PUR and EVA production. Now anyone can take advantage of the PUR technology with a remarkably low investment and use as a bonus one machine for all binding needs: thanks to its integrated casing-in system, Pureva XT produces effortlessly both soft and hard cover books for higher margins and a versatile product range. 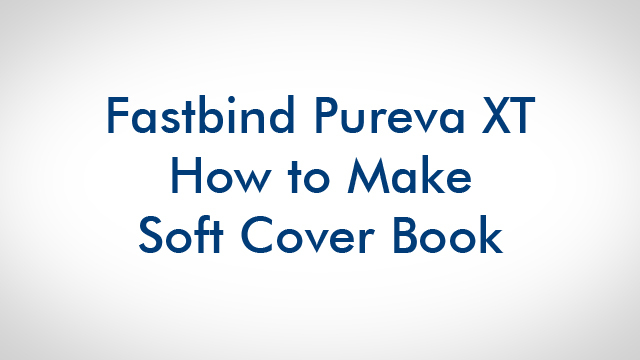 With the Fastbind Pureva XT, making a soft cover book is very easy. You just insert your cover and content. You can roughen the paper if you have coated or heavy stock. Apply EVA or PUR glue. Turn around and press to form the square spine. Your book is ready! There are no adjustments for format or thickness, from 1 to 50 mm and up to A3+. With traditional PUR machines, maintenance can be expensive and time consuming, making it hard to ensure a reliable finishing process in order to meet deadlines. PUREVA XT’s innovative glue mechanism is easily cleaned or even changed, thanks to economical glue cartridges making it possible to change from PUR to EVA in seconds. Electronic adjustable temperature control with single button operation when switching between glue types. Fastbind PUREVA XT features the new Fastbind PGO Microcut roughener. It provides an optimized cutting pattern that increases glue penetration for better binding strength. Unlike other spine rougheners that grind the spine creating lots of noise and dust, the PGO opens the paper grain with very little noise and almost no paper dust! Product information as of July 2014 and is subject to change without notice.